What is Freytag’s Pyramid? 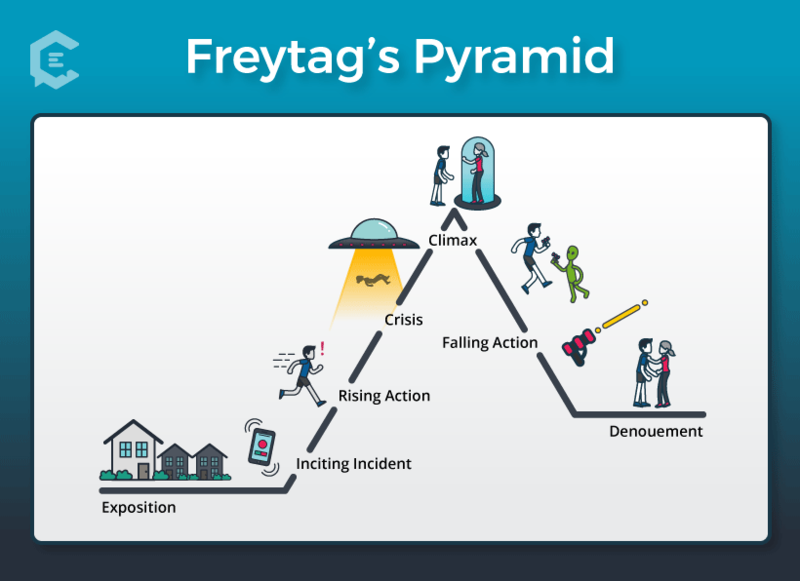 Devised by 19th century German playwright Gustav Freytag, Freytag’s Pyramid is a paradigm of dramatic structure outlining the seven key steps in successful storytelling: exposition, inciting incident, rising action, climax, falling action, resolution, and denouement. While I was the assistant director in Asia of an international nonprofit, one of my main responsibilities was communications. I asked program staff to send me articles intended for our website and print communications. Our staff covered the basics: a convening happened between x number of partners, the agenda covered so-and-so topics, and from that came world peace. Straightaway, I knew we had to write about our work differently to make it relatable, essential and contextual. We had to get to the heart of the conflict quickly without sacrificing context, and we had to weave the story of how our work made an impact on on-going social issues. Time and again, I came back to dramatic structure, and introduced our program staff (who were mostly English-as-second-language-writers) to Freytag’s Pyramid. Freytag’s Pyramid — well known among screenplay writers, playwrights and dramatists (and sometimes called “Freytag’s Triangle” ) — is not your typical topic for staff training within the nonprofit world. But this seven-step framework inspires good storytelling that can be applied to charitable work, policy campaigns, marketing and branding. Intrinsically, the story arc helps people feel sympathy for a character. It asks the audience to live in the character’s story world and feel the complexity of their problems. Story form persuades audiences to believe in an idea, a cause, and can influence them to buy a product or service, while also feeling that they are contributing to something larger. As listeners, when we are told a story, often we want it to have some chronological order and an unfolding of events that hint at an overarching meaning to the story. Gustav Freytag, the 19th Century German playwright and novelist, drew a simple triangle to represent dramatic structure and highlighted seven parts he considered necessary to storytelling: exposition, inciting incident, rising action, climax, falling action, resolution, and denouement (French for “the ending”). Exposition: The storyteller sets the scene and the character’s background. Inciting Incident: The character reacts to something that has happened, and it starts a chain reaction of events. Rising Action: The story builds. There is often a complication, which means the problem the character tried to solve gets more complex. Climax: The story reaches the point of greatest tension between the protagonist and antagonist (or if there is only one main character, the darkness or lightness of that character appears to take control). Falling Action: The story shifts to action that happens as a result of the climax, which can also contain a reversal (when the character shows how they are changed by events of the climax). Resolution: The character solves the problem or conflict. Denouement: French for “the ending,” the denouement is often happy if it’s a comedy, and dark and sad if it’s a tragedy. 1. Tell your brand’s story, even in a couple minutes. Not all marketing campaigns or product commercials have the luxury to include all parts of Freytag’s dramatic structure into a 2-minute ad. Yet those who strive to use the paradigm in their marketing content can see how it pays off. Here’s how the nonprofit Charity: Water used Freytag’s Pyramid to tell their brand’s story and launch its monthly giving campaign, “The Spring – The charity: water story.” Take a few minutes to watch this video before continuing to read on. In the beginning Exposition, Scott’s voiceover opens with the universal nature of water, how it’s essential and touches everyone’s lives. He’s creating the setting, the beginning of a story that will draw you in and let you know his backstory. For step 2 of Freytag’s Pyramid, the Inciting Incident, Scott brings to the forefront his mother’s illness. With this Rising Action (step 3), as he reveals the unraveling of his childhood and the burden of caring for a sick parent, Scott is building meaning, connection towards the main point of interest. Then Scott’s story reaches the Climax (step 4), when good-Christian-boy-turns-into-New-York-City-nightclub-promoter surrounded by drugs and alcohol. Yes, “Houston: We have a problem”; and Freytag called that the complication. It’s the zenith of the story where the hero falls into darkness and has to decide to change his fate. In the Falling Action (step 5), Harrison leaves the nightlife and ends up on a Mercy Corp ship traveling the globe as a volunteer photographer, documenting how facial deformities cause stigma and how a band of doctors helps patients look normal again. A clear reversal. The protagonist in Scott has beaten out the antagonist in Scott. And his Resolution (step 6)? After seeing how dirty water causes poor people to get sick, he wants to change the world by bringing clean water to communities that don’t have access. A redeemed Scott uses his New York nightclub promoting skills to raise money to help communities get clean water. Denouement: He’s heading a movement to end the water crisis and wants you to join. I know, I know. I omitted that the “The Spring – The charity: water story” video lasted 22 minutes. But did you stop watching? Alas, the power of telling your story using dramatic structure. There’s something to be said, in praise of a YouTube video about a nonprofit that can hold your attention for that long and not lose you. The video, no doubt, is aimed at donors who have already given to Charity: Water and marks the organization’s 10th anniversary. The longer form 22-minute video might have served as a centerpiece at a fundraising gala and was re-purposed for wider audiences online. 2. Envision your brand stories as extensions of marketing. Scott Harrison’s approach is one that shows how your brand story is an extension of your marketing strategy. Similarly, Blake Mycoskie, TOMS Founder and Chief Shoe Giver, recounts his trip to Argentina where he met children faced with hardship growing up without shoes. From that came his idea: One for One, where a purchase of a pair of TOMS shoes results in a gift of a pair to a child in need. The story arc within Mycoskie’s brand follows the similar pattern of Freytag’s Pyramid, but on top of the One for One idea, the company has spread portions of profits into other areas, such as correcting vision, providing safe water and birth; and social enterprise. Eyewear sold helps sight-saving surgery or prescription glasses. Places where TOMS coffee beans are sourced, water access is increased. Handbags purchased provide new moms with safe births. Backpack sales go to prevent bullying in schools. In many ways, TOMS marketing blurs the lines between its for-profit business and nonprofit support so seamlessly that shoppers cannot help but buy their products just for how good it feels to wear and own something that helps others in profound ways. The Freytag-style storytelling extends to the people TOMS serves. Stories about local leaders and community members are shared with customers to broaden the connection between buyer-donor and receiver-person-changing-their-community. What’s notable about TOMS’ marketing approach is the sensitivity in their use of language and the imagery used in their promotional materials. When you go to their Improving Lives site, pay attention to the words, images and the graphics of the world map. Beneficiaries are never characterized as desperate, poor or unskilled, and the images of buyers-donors is diverse — as diverse as the beneficiaries themselves. There is an intentional strategy to make sure that the buyer-retailer-beneficiaries relationship appears as a mutually beneficial one, built on respect and team-effort to make the world better. 3. Articulates your ideas creatively, further powered by storytelling. Often times marketing and branding tries to be linear with its ideas: This product is well-made; buying it makes life easier; buy it! Yet in a marketplace with thousands of similar products all claiming to save you time and energy, one that ties itself to a story that has intrigue and suspense, percolates to the top of our attention. Who could forget the 2016 Kevin Hart Superbowl Hyundai Genesis Ad? Exposition: A father (played by comedian Kevin Hart) greets an unsuspecting boy who is taking his daughter on their first date. To show he’s a nice guy, Dad lends the boy his new Hyundai Genesis. Rising Action: As the boy tries to bust moves on the daughter, lurking behind them is Kevin Hart. Inciting Incident: When the boy reaches to put his arms around the daughter while watching a movie, he turns around him to see Kevin Hart slurping a drink and hiding behind a bag of popcorn. Instantly, the boy is frightened; and caught between playing the cool guy to his girl and the good boy to her dad. Falling Action: The boy starts the car and decides to take the daughter home immediately. Reversal: Boy knows he’s messing with a crazy daddy. Resolution: Dad wins when his daughter gets dropped off at home early, thanks to the Hyundai Genesis’ Carfinder, a new feature that tracks the car wherever it goes. The Hyundai Genesis Ad helps us see how much an audience will give companies dramatic license. Another company, which sells customer service software, makes a courageous creative leap to sell itself by telling the story of a struggling garage band who shares the same name as the software company, Zendesk. The parody of an alternative garage band creating a concept album about customer service software comes off as rather “plausible,” and you find yourself absorbed by the story enough to sit through not-so-subtle Zendesk logo placements in almost every frame. By putting together this kind of lighthearted skit, it shows the guys who run this company can make fun of themselves and will likely listen to what you need and make it happen. I’d say that’s about all one can really ask of customer service software. 4. Use subtext in stories to entertain and educate us. In a short film called ‘Burt’s Bees: Burt Talks to the Bees: Worker Bees‘, the cosmetic company which touts that all its products use 98 percent natural ingredients, delves into life in the beehive. Never is there a mention of a Burt’s Bees face cream, lotion or shampoo. Instead, through Burt’s questions to the worker bees and their responses, he comes to his own realization, that buying local, organic honey supports bees and their security. The dramatic structure of how the female worker bees tell Burt how they keep hives healthy educates buyers about environmental threats bees face, such as Colony Collapse Disorder. Rendered through beautiful paper-cutting art and a cameo by famed actress and film creator Isabella Rossellini, the film enchants while it educates. There is no plug for Burt’s Bees explicitly, but at the end of the film you are convinced through the subtext that Burt and his company care about the environment, the sustainability of bees, and how that carries over into his products. An inherent part of why branding using Freytag’s method works is that it allows for subtext, or undertone within its creative approach. The sales pitch is not explicitly announced by characters, but rather becomes something that is understood by the observer of the marketing as the story unfolds. This engagement of the consumers’ mind is not subliminal, but active. It stimulates them to think of the implications, benefits, and the greater good in buying the product. 5. Counter implicit bias to heighten your storytelling (by causing people to challenge the presumed narratives they already have in their heads). I came across a video on my Facebook feed called Fans of Love, where a kiss-cam circles the crowds of an NFL Pro Bowl stadium looking for couples to zoom in on. As the camera draws closer to couples, it hovers over a man and a woman, only to redirect its lens when the man reaches to kiss his male partner, and the crowds cheers them on. I get choked up thinking about it, how it challenged my own implicit bias, and how the campaign truly asks me to rethink bias. The camera continues to glide over the crowds and stops at other couples: a woman in a wheel chair with her white male partner, a Muslim woman with her African-American friend, a lesbian couple both African-American and Latina. Each time the subtext is there: We have set ways that we define relationships, friendships and love, but Love Has No Labels. In the Love Has No Labels campaign, changing behaviors and mindsets is the “product” they are selling, exposing how implicit biases creep into our assumptions, stereotypes and unintentional reactions we have towards people we label as different based on race, religion, age, gender, sexual orientation and ability. These are accumulated biases from family, media, pop culture, and often found in the subconscious, the storehouse where subtext swirls.